When I was a kid my favorite flavor was grape. You name the artificially colored, artificially flavored, high fructose corn syrup-sweetened junk food, I wanted the grape version of it – grape candy, grape juice, grape jelly and of course, grape soda. But I could never understand why none of it ever tasted like grapes. 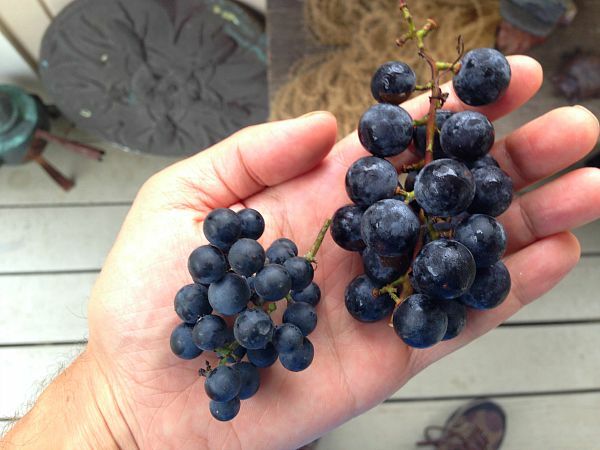 Growing up on Long Island in the 1980s my father would come home from the grocery store with green and red seedless grapes from California. They were OK but they were more tart than sweet. 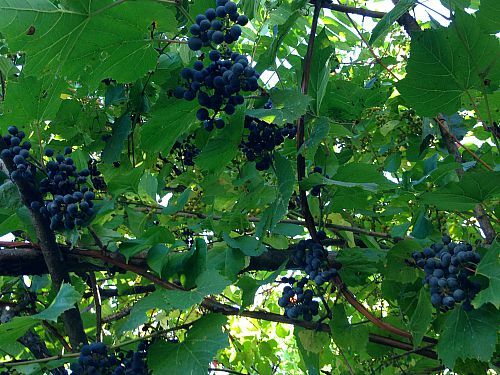 I’d just moved into a new place in western Massachusetts and there was a Concord grape vine growing in the backyard. I’d never had a Concord grape in my entire life. Never saw them in a grocery store. But with my first taste, I finally understood. They were so juicy sweet and so full of that big, bold, bright grape flavor so characteristic of so many of my favorite childhood grape-flavored sweets. 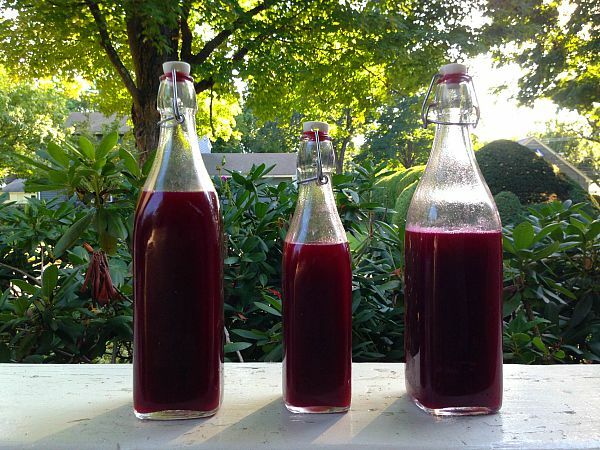 I’ve recently started making homemade lacto-fermented soda. I’ve made a blueberry soda, watermelon soda and raspberry soda. 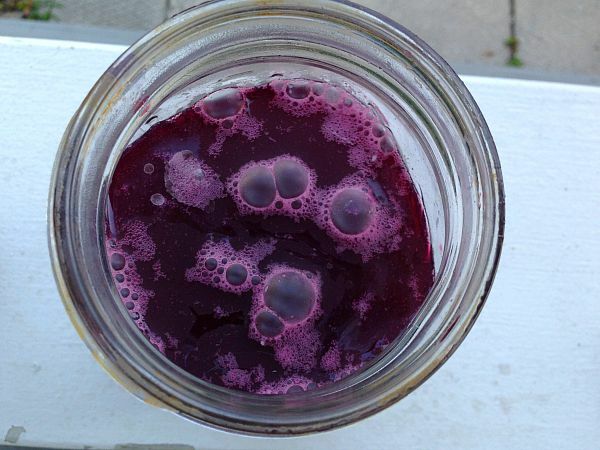 And this past week I finally got around to making a lacto-fermented Concord grape soda. The byproduct of lacto-fermentation results in probiotics, enzymes and actual beneficial nutrients. Commercial sodas contain none of those things and are full of artificial junk. 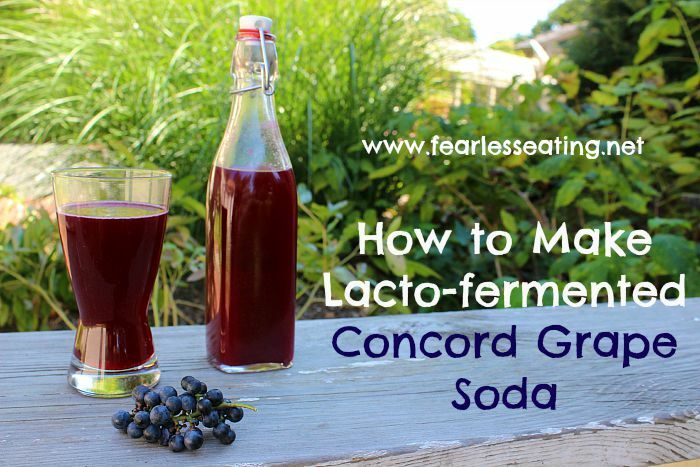 Lacto-fermented Concord grape soda contains the actual flavor of Concord grapes. Imagine that! Commercial grape sodas use artificial and “natural” flavors to mimic the flavor of Concord grapes. 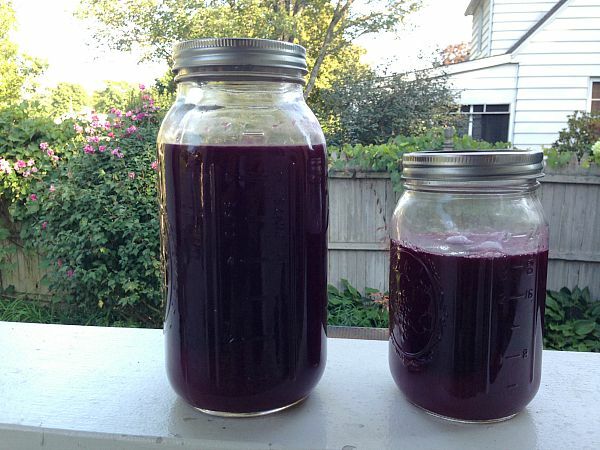 Lacto-fermented Concord grape soda is purple due to the natural purple color of Concord grapes. Commercial grape soda is artificially colored purple, often with the food dye Blue no. 1. 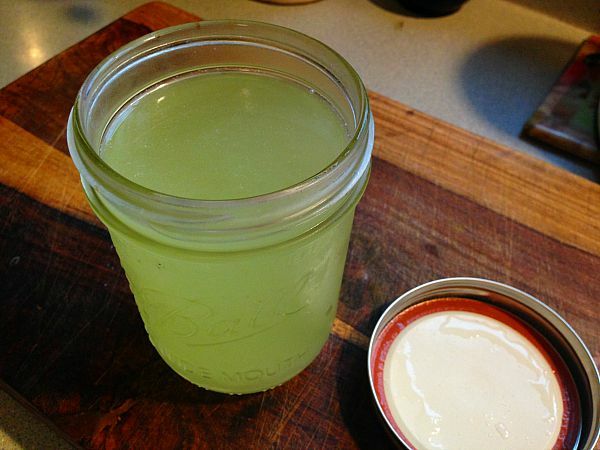 Making homemade soda is ridiculously easy. Kids will love making the soda at home and maybe even finding the grapes! On rare occasions, I’ve noticed them in grocery stores. But if you live in my neck of the woods, you can get them for free by foraging for them. Don’t worry. They’re not hard to find. They grow wild here in Massachusetts and many other parts of the northeast. 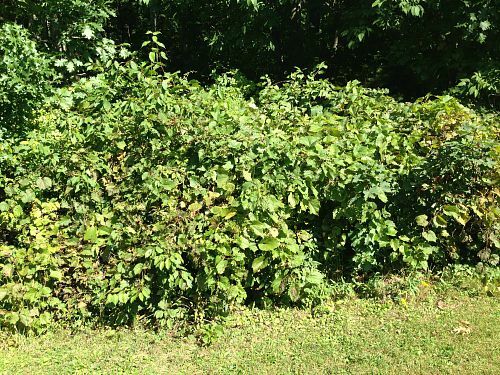 During late summer and early fall, they seem to grow everywhere – along trails, bike paths, roads, up and over fences, trees and utility poles. Just start looking for them and you’ll probably find them. Now the key, and this is the most important part, is to find the big fat juicy sweet ones. That’s not always easy. You could use the ones on the left but the ones on the right are SO MUCH SWEETER. So try to find the bigger ones if you can. Besides making soda, they make a fantastic and healthy snack too. It’s literally like eating grape candy, but without all the chemical crap. If you suffer from sugar cravings, especially at night, these are soooooo much better than say, oh I don’t know…grape Skittles. And I’ve frozen quite a few too. They’ll make a great snack in the middle of winter. 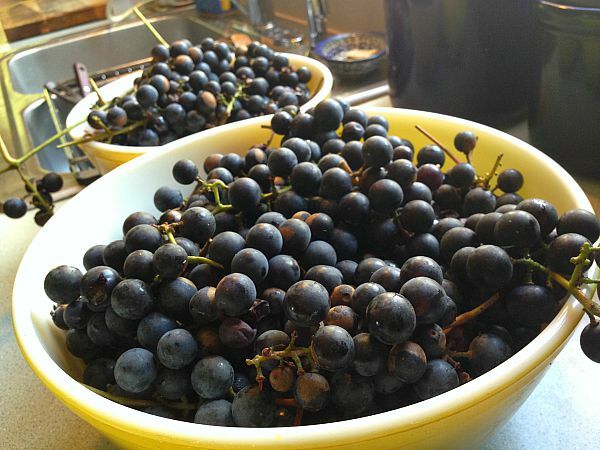 OK, let’s finally get to making the Concord grape soda. 1. 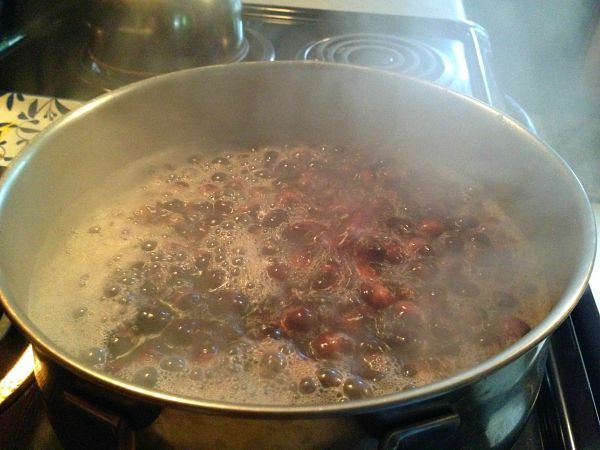 Simmer grapes and sugar in water for about 20-30 minutes. 2. Cool to room temperature and strain out the grapes. 4. Add whey and let it ferment for at least 3 days. Swish the soda around once a day to prevent mold from forming on the surface. Look for visible signs of fermentation via a slight fizziness. Like so…. I let mine ferment for about 5 days but you can go as long as 10 days. The longer you let it ferment the less sugar there will be as the bacteria will consume and convert the sugar during fermentation. Taste the soda as you go to get the sweetness you desire. Now regarding the whey, I usually get TONS of questions about whey. Here’s my jar of whey that I made from a quart of yogurt. Whey is a starter culture. It kickstarts the fermentation process as it contains live bacteria cultures. Yes, you have to make the whey yourself. No, you can’t buy it in stores (we’re using liquid whey not a whey powder). Don’t worry. It’s ridiculously easy to make. Here’s how to do it. Now if you have a dairy allergy there are several options for using starter cultures beyond whey. Other starter cultures include a ginger bug, water kefir and champagne yeast. 5. Transfer grape soda to soda bottles. 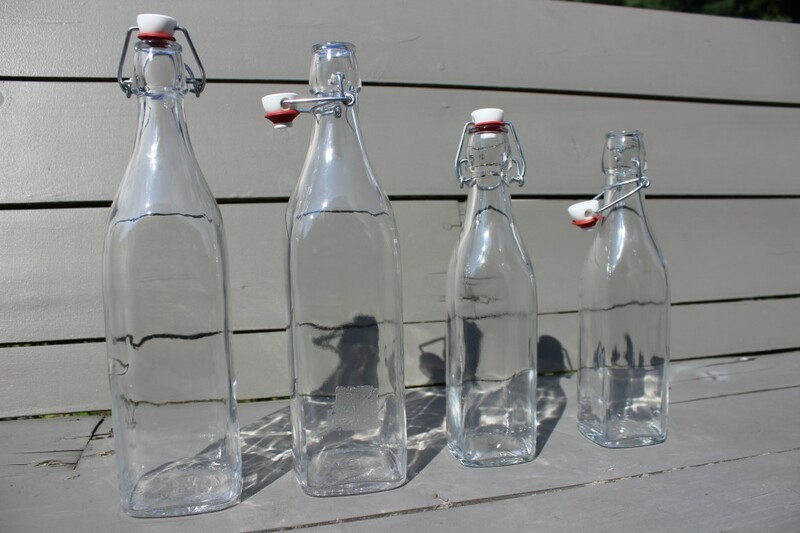 Soda bottles increase the natural carbonation. Here’s some soda bottles I picked up from a local kitchen store where I live in western Massachusetts. Those flip cap bottles are fantastic and make bottling and opening the soda very easy. If you can’t find soda bottles in a store near you, you can find them here on Amazon. You can also use plastic soda bottles too. 6. Keep the soda bottles at room temperature and check every day. The carbonation will increase rapidly! That’s what the soda bottles are designed to do. The soda is often ready in one days, two days max. Open the bottles every day to let some of the gasses escape. Do it over the sink to be on the safe side. You’ll probably get a nice pop and fizz the first time you do it. After a few days, you can move the bottles to your refrigerator where the fermentation will dramatically slow down. 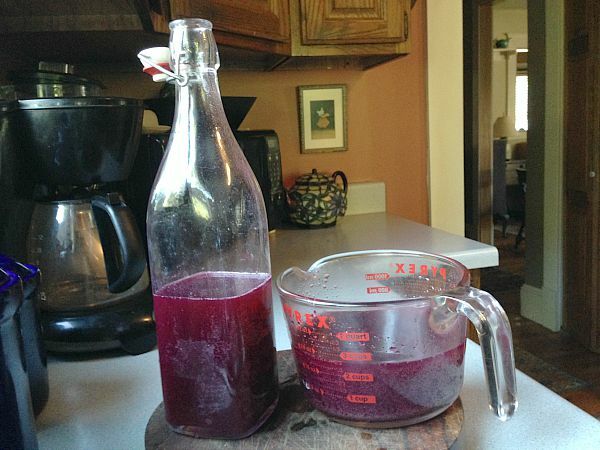 This is a REAL fermented grape soda made with actual grapes and real ingredients! Simmer grapes and sugar in water for about 20-30 minutes. 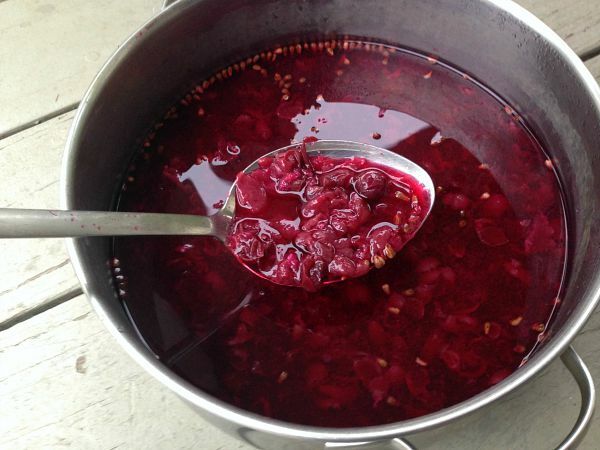 Transfer what’s now essentially grape juice to some 2 and 1 quart glass ball jars or demijohn. Add whey and let it ferment for at least 3 days. Swish the soda around once a day to prevent mold from forming on the surface. Look for visible signs of fermentation via a slight fizziness. Transfer grape soda to soda bottles. Keep the soda bottles at room temperature and check every day. The carbonation will increase rapidly! That’s what the soda bottles are designed to do. The soda is often ready in one days, two days max. Open the bottles every day to let some of the gasses escape. Do it over the sink to be on the safe side. You’ll probably get a nice pop and fizz the first time you do it. After a few days, you can move the bottles to your refrigerator where the fermentation will dramatically slow down.